Harris Breast Center, located in the Center for Advanced Medicine at Boone Hospital, offers 3D mammograms for all patients. Soon after it was approved by the FDA in 2012, Harris Breast Center was one of the first facilities in the US to offer this technology. A 3D mammogram allows a closer look into the breast tissue by showing multiple small images through the tissue. This is very similar to a CT scan. The exam is only 15 seconds longer than a traditional mammogram and has been shown to detect additional cancers in all breast densities. This procedure also decreases the number of false positives. With this exam, the radiation dose is slightly higher, but it is within the lawful limits. “C View,” a recent development, will soon be added to this exam. 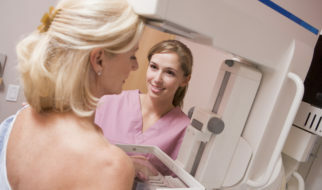 This will reduce the dose back to the level of a traditional mammogram. To learn more about this procedure, click here.